Personally,I am not very fond of Rose water and haven’t used one in a very long time. 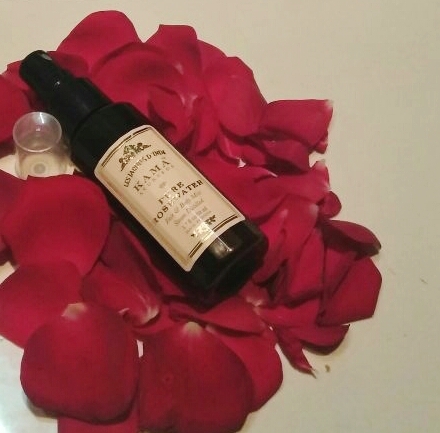 Kama Ayurveda’s Rose water is one their best sellers and is much raved about, by a lot of people. I have been looking for a substitute for my La rosheposay thermal spring water as it is a bit heavy on the pocket and so I thought of giving this product a Try! Kama Ayurveda Pure Rosewater is made from the roses of Kannauj, a region in North India rich in in white soil conducive to roses growth. The Kannauj Rose is considered special as it has the same specification as the Bulgarian Rose. The steam water distillation process used to create this wonderful rose water ensures a high level of hygiene and unmatched purity. 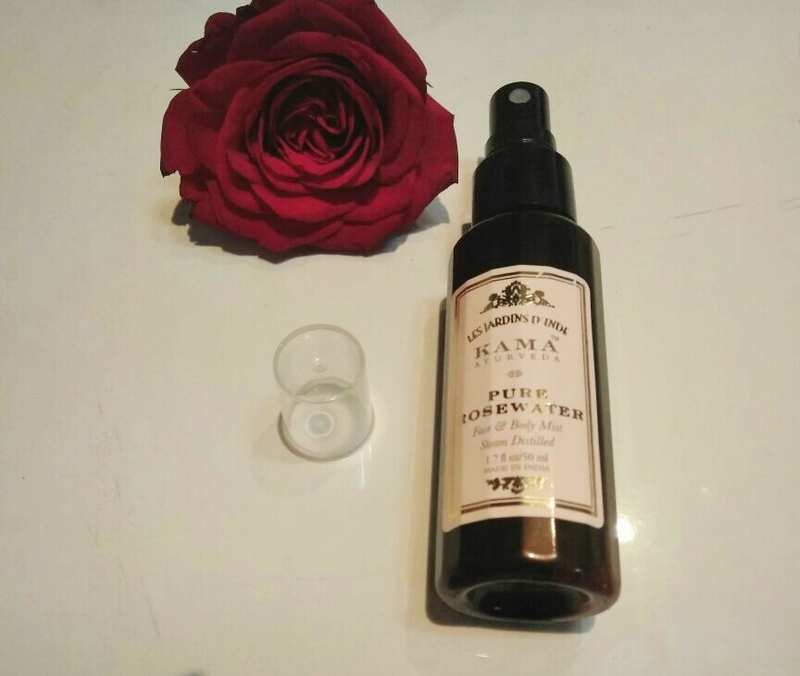 Kama Ayurveda Rose water comes in a brown coloured sturdy plastic bottle packaging with a spray mechanism. I have to mention that the nozzle which releases the product is very sturdy that you can never go over board with the product. Brownie point for that ! 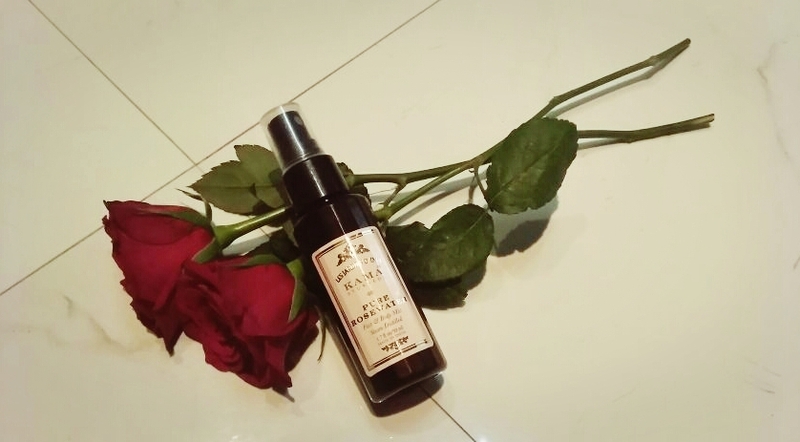 I use this product twice a day ie in the moring and night after washing my face, I just Spritz it on and let it dry on its own and then moisturize my skin.I am not very fond of the fragrance of Roses but this one has comparatively a mild pleasant fragrance which makes it manageable  . My first impression was definitely not OH I love it simply because on application it felt just a regular face mist with no cooling sensation but after using it for 5 6 days when I touched my skin after applying it my skin definitely felt softer than before and it also gives a natural glow to your face. Being all natural you can be assured it won’t harm your skin and would be great for people with irritated skin in reducing and calming the redness as its alcohol free and very light on the skin and without a Doubt you can replace your toner with this rose water. Overall ,I would give it a 4/5. Alcohol free and Very light on the skin. Sturdy pacakaging + its travel friendly.